Armin Laschet (born 18 February 1961) is a German politician. He currently serves as one of five deputy chairmen of the Christian Democratic Union of Germany (CDU) and head of the party in Germany’s most populous state, North Rhine-Westphalia. Laschet was born in Aachen-Burtscheid. He attended the Pius-Gymnasium in Aachen and studied law at the universities of Bonn and Munich. In Munich he became a member of K.D.St.V. Aenania München, a catholic student fraternity that is member of the Cartellverband. Following the 1994 national elections, Laschet became a member of the German Bundestag. He served on the Committee on Economic Cooperation and Development as well as on the Committee on the Affairs of the European Union. As Member of the European Parliament, Laschet served on the Committee on Budgets between 1999 and 2001 and on the Committee on Foreign Affairs between 2002 and 2005. 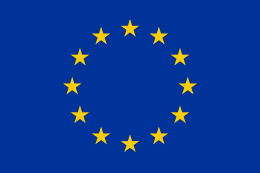 In the latter capacity, he served as the Parliament’s rapporteur on relations between the EU and the United Nations. Under Minister-President Jürgen Rüttgers in North Rhine-Westphalia, Laschet served as State Minister for Generations, Family, Women and Integration from 2005 until 2010, and as State Minister for Federal Affairs, Europe and Media from 2010. In 2010, he unsuccessfully ran against Norbert Röttgen for the post of CDU chairman in the state. When Röttgen resigned from that office in 2012, Laschet was elected as his successor. Laschet currently serves as state MP in the Landtag of North Rhine-Westphalia, he heads his party's parliamentary group there and also chairs CDU's state chapter (Landesverband). Since 2014, he has been a member of the North-Rhine Westphalia Commission on Constitutional Reform, led by Rainer Bovermann. 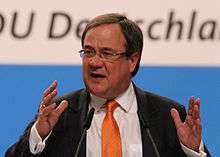 In the negotiations to form a Grand Coalition of the Christian Democrats (CDU together with the Bavarian CSU) and the Social Democrats (SPD) following the 2013 federal elections, Laschet was part of the CDU/CSU delegation in the working group on energy policy, led by Peter Altmaier and Hannelore Kraft. In November 2015, Laschet visited the Zaatari refugee camp in Jordan to learn more about the plight of Syrians fleeing the violence in the ongoing Syrian civil war that erupted in 2011. In November 2016, Laschet was elected leading candidate for the North Rhine-Westphalia state elections in May 2017. During the European debt crisis, Laschet called for an “open discussion” toward a broad solution to the debt crisis, of which Eurobonds could be a part. He argued that a Greek exit from the Eurozone could trigger undesirable upheaval in southern Europe: "(An exit) could lead to instability in a NATO member state. Russia is standing ready with billions to help Greece in such a scenario." In October 2011, he signed George Soros' open letter calling for more Europe in the single currency turmoil. Following a 2001 visit to the Middle East, Laschet reignited a controversy over EU funding for anti-Semitic textbooks used in Palestinian schools by comparing them to Nazi propaganda, prompting him to urge for more stringent controls over how funds earmarked for Israel and the Palestinian Authorities are spent. In 2004, the European Commissioner for Competition Mario Monti publicly rejected claims made by Laschet according to which a ban on German soccer team Alemannia Aachen’s bid to play important UEFA Cup matches in neighbouring Holland is a breach of the Union’s anti-trust rules. Laschet has three children, Julius, Eva and Johannes Laschet, and is married with Susanne Laschet. ↑ David Cronin and Martin Banks (November 19, 2003), Afghanistan drug trade still proving a tough nut to crack European Voice. ↑ Patrick Donahue (August 17, 2010), Germany’s Roettgen to Run for State CDU Leadership, Bild Says Bloomberg News. ↑ Helmut Rehmsen (November 30, 2015), Gespräch mit Armin Laschet über Flüchtlinge in Jordanien: "Die Grenzen sind hier immer schon offen" Archived December 12, 2015, at the Wayback Machine. WDR 2. ↑ Armin Laschet ist CDU-Spitzenkandidat in NRW Bild, November 26, 2017. ↑ Jeff Black (August 16, 2011), Eurobond Support Growing in Merkel’s CDU, Handelsblatt Reports Bloomberg News. ↑ Matthias Sobolewski (August 27, 2012), German lawmakers say "Grexit" not just economic risk Reuters. ↑ George Soros and 95 others (12 October 2011). "As concerned Europeans we urge Eurozone leaders to unite". ft.com. Financial Times. Retrieved 17 June 2012. ↑ David Cronin (July 25, 2001), Palestinian books remind me of Nazis, says German MEP European Voice. ↑ Peter Chapman (June 9, 2004), Monti backs UEFA foreign stadia rule European Voice. ↑ Presidium United Nations Association of Germany (DGVN).